Author Steven Schussler is an amazing man. He is an entrepreneur who has had tremendous success in the development of his Rainforest Cafe’s and other theme based restaurants. His new book entitled ” It’s a Jungle in There-Inspiring Lessons, and Hard-Won Insights and Other Acts of Entrepreneurial Daring” is a great book for anyone who wants to learn lessons on personal mastery. During our interview together we discuss what Steven refers to as the five (5) P’s of successful entrepreneurship. Those P’s are: Personality, Product, Persistence, People and Philanthropy. Steven emphasizes that if you are going to be an entrepreneur then you have to be willing to take risk, that is just part of being in business for yourself. He has a wonderful formula, that in his estimation is an important element, it is PASSION + AMBITION=YIELDS SUCCESS. Steven says that without passion for your product or service you are going to be hard pressed to become successful. Your belief in what you are doing, and your passion are going to be the elements that assist in your personal success. Steven is someone who listens to his inner voice or intuition. He admits that all good entrepreneurs have the ability to listen and act on their intuition. Many of his good decisions came from listening, then having the faith to act on his intuition. I know that many of us hear the voice within, but do we act or are we afraid? As Steven says you can’t be afraid, you have to go for it! Steven also emphasizes that you need to dream big to become successful. He mentions that when you do dream big and if you are passionate about what you are doing the outcomes are much more rewarding and fulfilling. He quotes Norman Vincent Peal “Believe It and You Can Succeed”. That is so true, if you believe in what you are creating and in yourself you can do almost anything. 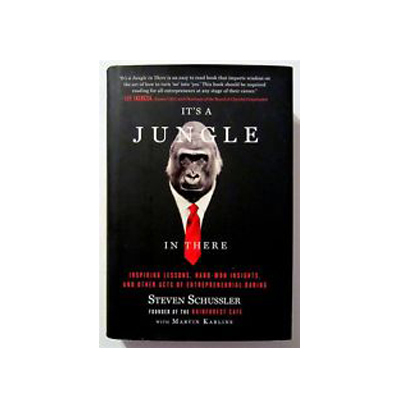 If you want to learn from a man who not only believes in his projects, and himself then you need to listen to this podcast with author Steven Schussler the author of “It’s A Jungle In There“. For more information about Steven Schussler and his new book please click here to be directed to his website.